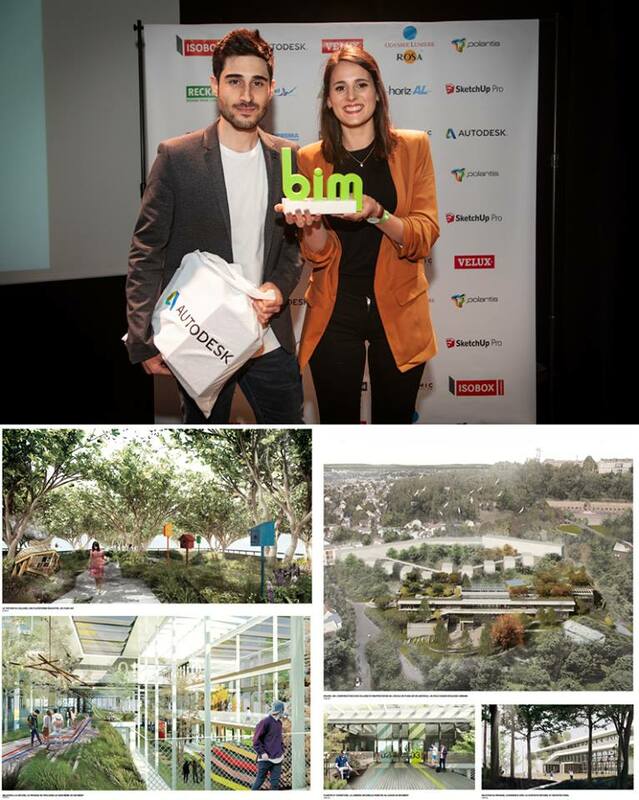 Marisol Declercq and Emmanuel Lara won the first prize with an ambitious, elegant, organic and… super poetic project. What happened during the ceremony? Who were winners? You will find the answers here. 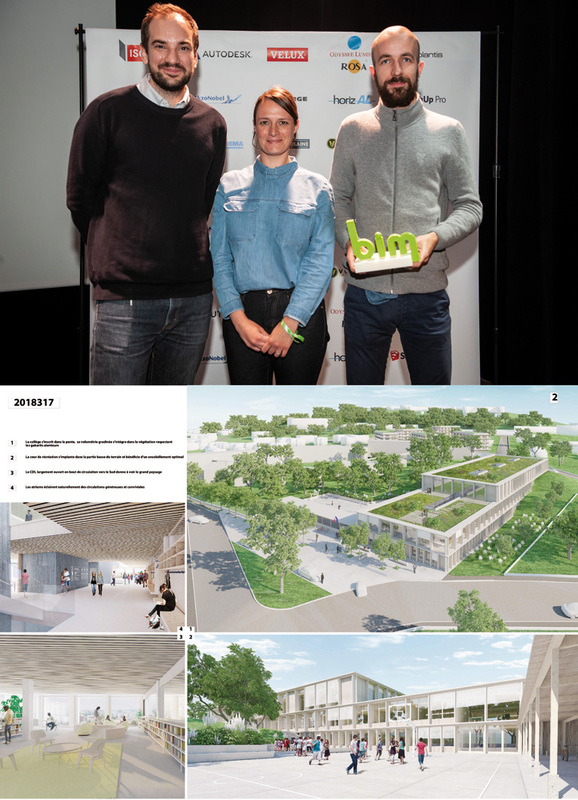 On the 26th of April the awards ceremony of the 2018 BIM Contest took place. 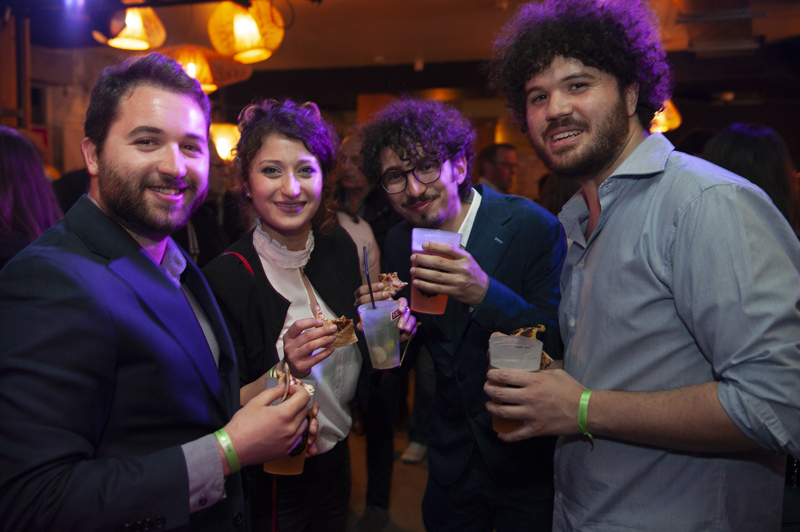 The guests, who are construction experts, were welcomed by Polantis and our partners, at the Halle Pajol (Paris 18ème) in order to find out who the winners are on this very special year. For this 3rd edition, Polantis was joined by the city of Suresnes and by the INS HEA (Higher National Institute of Formation and of Research for the Education of Young Disabled persons) in order to bring about a reflection on an urban treasure from the 30’s: l’Ecole de Plein Air de Surenes (the open air School of Suresnes). This school is listed as a historic monument. The candidates -architects and architecture students- had to create a numeric model of a middle school (of 500 students) located on a field close to the school, instead of where the INS HEA is now (since it is soon going to be relocated). Linked to this year’s program, the topic of the roundtable meeting was the BIM and the built environment. Who were the speakers of the roundtable meeting? Emmanuel Sorin, Architect and co-founder of the SONA Architecture agency. Pierre Navarra and him were the winners of the PTNB’s contest “Ouvrages existants” in 2017. Manuel Asfar (project manager at the Ateliers 2/3/4/) and Jean-Noël Burnod (IT Manager at the Ateliers 2/3/4/). The agency has renovated the old Ampère Tower (built in the 1980’s at Courbevoie), which is the new headquarters of Sogeprom, renamed Ampère e+, since 2016. Christophe Leray (Redactor in Chief, Chroniques d’Architecture). He writes about the current events and the changes in architecture. The evaluations of the candidates’ projects were based on five criteria. They had to respect the program and the expectations of the city and the INS HEA (such as the accessibility for all the disabled persons). The architectural quality and the integration on location. The BIM methodology had to be respected and proved. Finally, the industrial sponsors’ products had to be included within the numeric model. Marisol Declercq is an architecture student at the Ecole Nationale Supérieure d’Architecture de Val de Seine, Emmanuel Lara is an architect. Unfortunate finalists of the two first editions, they successfully won the first prize in 2018. Instantly renamed by the members of the jury the “environmental project”, this project was a source of enthusiasm. We must say this building does not leave you indifferent. Suresnes explains: “This project of reallocation is trendy… yes… but it also is very relevant.” Henri Sellier, mayor of Suresnes from 1919 to 1941, wanted the Ecole to be a privileged spot for the development of the well-being and health. Finally, last but not least, the numeric model is remarkable: light, complete, navigable. The exportation of the settings to fill the COBIe is impeccable. The control of the BIM (Building Information Modeling), this construction method from the future, is perfect. At first sight, the façade of this project seems to be “austere”, the form of the buildings simplistic… but in reality… the candidates have faced a real challenge: they have created a contemporary building with a modern style. The building is a very interesting hybrid from an esthetic point of view. Green, mineral and powerful, in perfect symbiosis with the Ecole. The sustainability of the middle school can also be perceived through the reallocation: some accommodations and activities that could create some intergenerational link and… some finances! “This shows us the different perspectives for the city and could make the place live again!” specifies Suresnes. 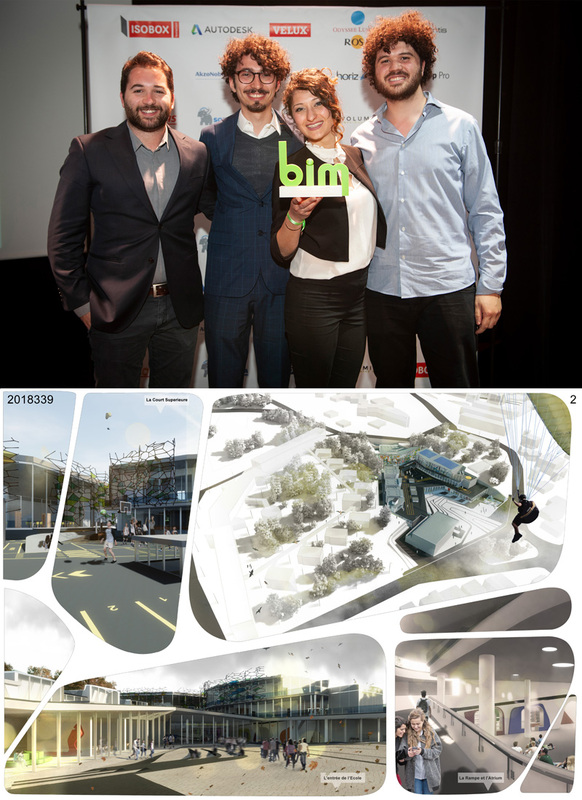 This team composed by four Italian architects won the third prize of the Contest. Concerning the BIM, it is remarkable. In a nutshell, this project is obviously the result of a big investment and a strong work. The jury members: Marie-Pierre Deguillaume, Representative of the city of Suresnes; Didier Sadoine Representative of the INS HEA Heritage Project; Pierre-Gilles Parra, Supervisor of directives at ISOBOX Insulation; Emmanuel di Giacomo, European Supervisor for the Development of BIM Ecosystems at Autodesk; Eddie Alix, Project Manager of the Building Construction Digital Transition Plan; Jérôme Bonnet, BIM Group Manager at AIA associates; Jacques Lévy-Bencheton, Vice-President SIGHTLINE GROUP and Associate Architect at Brunet Saunier Architecture; Fabrice Lagarde and Vladimir Doray, Associate Architects at WRA; Itaï Cellier, Architect, Founder and President and Director-General of Polantis. 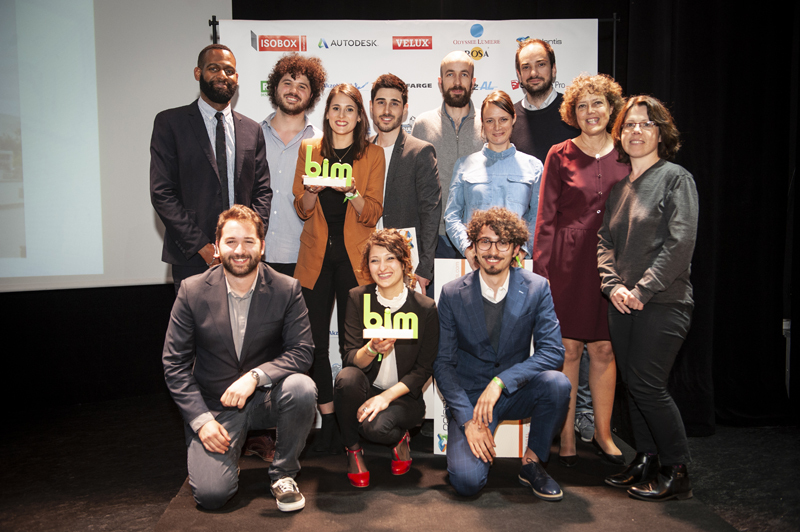 The ceremony ended on an invitation to get to know more about the winners of this 2018 BIM Contest and to come see the exhibition of the 10 finalist teams at the MUS of Suresnes in July. During the cocktail, Volumic 3D, 3D professional printers from Nice, showed us how they print in 3D. Tecxor was there as well: the agency specialized in virtual reality with 3D headphones asked the guests to wear 3D glasses to have a virtual look into some apartments that seemed more than real. Thanks to the sponsors of the 2018 BIM Contest: Autodesk, ISOBOX Isolation, Velux, Solardis (Soprema), Velux, Rosa Odyssée Lumière Export, Lafarge, La Toulousaine, Horizal, Reckli, AkzoNobel Powder Coatings et SketchUp (Elmtec). They made this third edition possible. Thanks also to the “mentors” of the Contest, the ones specialized in the BIM ecosystem: le Plan Transition Numérique dans le Bâtiment, l’Ordre des Architectes, l’UNSFA, Sightline Group, le Club BIM Prescrire, HEXABIM, BTP.tv and Mediaconstruct. To get to know more about the 2018 BIM Contest, call Manon Roger: 01 42 64 07 02. Or send her an email: manon@polantis.com.